Could You be Arrested for Passengers Drinking in the Car While You Drive? - Crooks, Low & Connell, S.C.
Could You be Arrested for Passengers Drinking in the Car While You Drive? While most people know that drinking and driving can lead to a conviction, criminal liability for driving with drinking passengers tends to be a source of confusion. The laws in this area vary from state to state, and in many states (including Wisconsin), it is not necessarily the passengers’ act of drinking that can lead to a driver’s arrest. 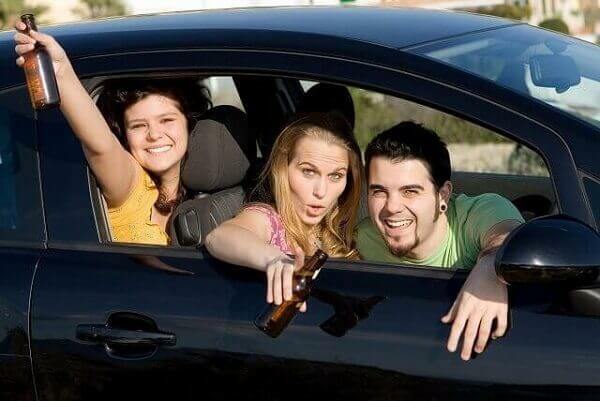 “No person may possess on his or her person, in a privately owned motor vehicle upon a public highway, any bottle or receptacle containing alcohol beverages . . . if the bottle or receptacle has been opened, the seal has been broken or the contents of the bottle or receptacle have been partially removed or released. In other words, with only limited exceptions (i.e., if the open container is stored in the trunk or a truck bed), it is illegal to drive with an open container anywhere in your vehicle – including in the possession of a passenger. If you get pulled over for speeding or some other traffic offense, or if a police officer happens to notice that the passengers in your vehicle are drinking, you could be charged with an open container violation (in addition to any other violations) based upon your passengers’ alcohol consumption. When facing charges in Wisconsin, whether for a traffic violation or a serious criminal offense (such as OWI or PAC), it is critical that you understand the potential consequences. On top of fines and other penalties – which alone are justification enough to seek legal representation – having a conviction on your record can impact your life in several different ways. Your insurance rates can increase. You can face challenges getting into college or landing a job. If you lose your license and no longer have a way to get to work, your livelihood could even be at risk. While the penalties for open container violations in Wisconsin are fairly minor, individuals charged with open container violations will commonly face other charges, as well. To make sure your case affects your life as little as possible, you should talk to an attorney about the defenses you may have available. Schedule a Consultation at Crooks, Low & Connell, S.C. If you are facing charges in central Wisconsin and would like to discuss your case with an experienced defense attorney, contact the Wausau law offices of Crooks, Low & Connell, S.C. To schedule a confidential consultation, please call (715) 842-2291 or inquire online today.